Branding creates an identity using a combination of designs, symbols, or words that differentiate products and services from others in their competing markets. The identity expresses the value proposition, the company story, and the benefits and attributes of the product. The result is a promise to the customer that tells them what value they can expect. Brands arise out of the analysis of the company values, mission, and story. The features and benefits of products and services must be incorporated in the brand and provide a message to potential consumers. All of these components create a voice for the brand as long as brand development follows the three C’s of Branding. Brands must have credibility, clarity, and constancy in order to communicate the perception and reality of quality and value to customers. A strong brand will influence customer choice. Customers will recognise the brand and associate it with quality and value. Brands like Heinz Ketchup and Deloitte Consulting, LLP demonstrate the value of a strong brand. A strong brand creates loyalty and keeps customers coming back. This not only creates loyalty, but brand advocacy by customers. Fred Reicheld did a study that posited that the most important customer satisfaction question centres around whether or not a customer would recommend a product or service to a colleague or friend. The customers who would recommend are telling other people about the products and services they use. Free marketing. A strong brand can command a higher price. Customers who perceive greater value pay more. Everyone pays more for some product the use because they perceive that the product has increased quality or value. A strong brand is a platform for growth. It provides a framework for product and service integration for expansion. A strong brand provides opportunities for diversification of products and services. Branding conveys the message that a company is established and credible. A strong brand offers the opportunity to charge a premium. These means pricing products and services above other comparable products and services in the market place and retaining market share and brand loyalty. People will pay more for a Mercedes regardless of whether or not it lasts longer, performs better or looks the best. Products and services that are perceived to have quality, drive customer behaviour. Coach sells very expensive purses and consumers perceive that these purses exceed teh value and quality of other less expensive purses on the market regardless of their true value. A strong brand can lead to a lower cost of sales. Customer acquisition prices lower over time because because loyal customers buy more frequently and recurrently. In addition they often engage in product advocacy. A strong brand requires lower promotion costs because brand recognition and loyalty increase. 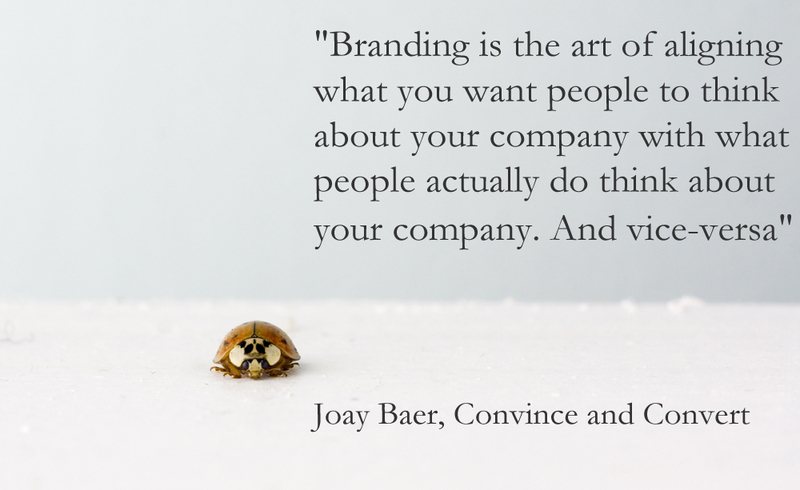 It becomes less necessary to focus marketing efforts on brand recognition. Resources can be reallocated to R&D or other potential income producing activities. A strong brand promotes higher market share and higher market saturation causing higher profits. This is the main financial reason to brand well and maintain the brand integrity over time. Some studies indicate that perceived quality created by a strong brand contributes more to return on the investment than market share. In order to reap these financial benefits it might be a good idea to ask some questions about business and brand? What is the brand position of competitors in relation to company brand? No one wants to follow their competitors trends. It is best to be in front. What sets the business apart from its’ competitors? If you can’t define this, you can’t have a strong brand. Does the branding reflect the value proposition? Do your customers recognise your value proposition and can they articulate it? What is the company’s brand personality? Brands like Starbucks and Google have very distinct personalities. What is your personality? What do your customers say about your products and services? If you answered any of these questions with a “no” or an “I don’t know” you may not be getting the desirable and robust financial benefits of branding. It may be time to revisit the company brand and make changes to assure that the return on investment has been maximised by the branding strategy. Brands are more becoming more and more important in the global marketplace. The marketing department is becoming an income generator. Failure to recognise the importance could easily result in being left behind. Just like Swiss watches. Keenpac act as brand guardians so when commencing with any project we make sure we adhere to guidelines, colour and overall consistent brand delivery.